As I was scrolling through my research today, looking for something to paint, I happened to glance over to my painting table, and there was a found still life, all full of interesting angles and curves and light, saying paint me. So I did. 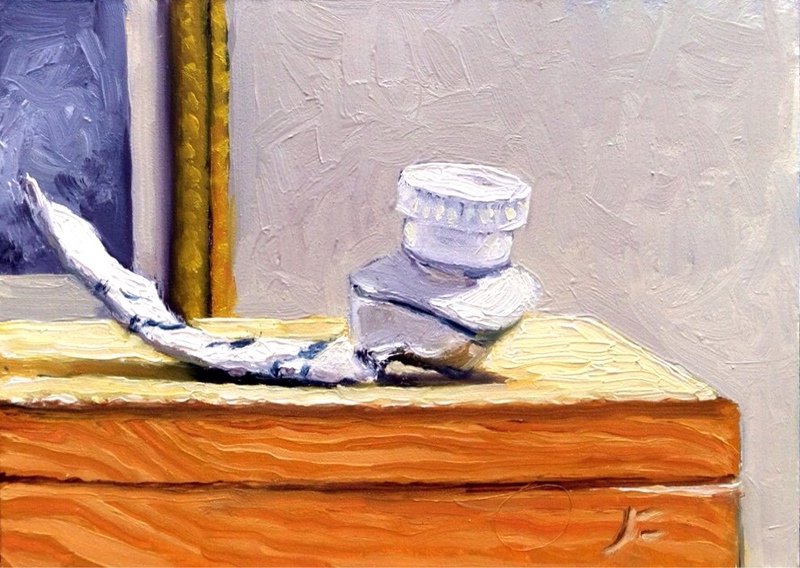 An empty tube of Titanium white, Alkyd, on top of my traveling paint kit. This one just needed to be five by seven instead of six by six, and because today was the day I had chosen to make some changes to my blog, notably a new way of bidding, I decided to start the bidding at $100 rather than the usual $200. So jump in, have some fun, and good luck. Auction to end at Noon on June 30, 2014. Gallery retail price = $600. I like the colors but it needs more depth. Maybe the camera made it look like flat.